Santa Monica Pier features Pacific Park amusement park, restaurants, gift shops, an arcade, as well as views of Santa Monica beach and the Pacific Ocean. 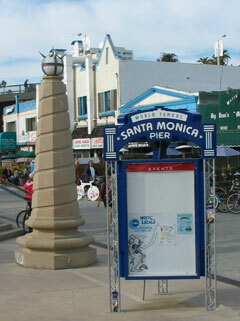 To get to Santa Monica Pier from Santa Monica Place, walk on Colorado Street toward the ocean. Santa Monica Place is an indoor shopping mall. Features department stores, shops and a food court. Third Street Promenade is an outdoor shopping district where three blocks of 3rd Street have been designated for pedestrians only. It features name-brand stores like Armani Exchange, Lucky Brand, Sephora, and Abercrombie & Fitch. There are restaurants and a food court. Third Street Promenade is usually active until around midnight. There are quite a few clubs for after-hours entertainment. Third Street Promenade is directly across the street from the Broadway Street entrance of Santa Monica Place. There are quite a few restaurants within walking distance of the Promenade, such as Benihana and PF Chang's. Montana Avenue has upscale stores, but is not dedicated to pedestrians like 3rd Street, and it is not within reasonable walking distance. From LAX, a bus ride takes 30-60 minutes each way (including transfers), 1/4 mile walking required. To get to Santa Monica from LAX, take Lot C Shuttle to LAX Transit Center, then Santa Monica Rapid 3 (BLUE RAPID) to Santa Monica Place. If you want to see the Pier first, walk to the end of Colorado Ave. If you want to see Third Street Promenade first, walk to Broadway and 3rd street, or walk through the mall to the food court and exit onto the Promenade. To get to Venice Beach from Santa Monica, take Santa Monica Big Blue Bus #1 or #2. If you want to stroll around the Promenade, visit some shops on 3rd Street and in the mall, then walk down to the pier, give yourself at least 2 to 3 hours, plus travel time. So you will realistically need at least a 4-5 hour layover for this excursion. If you want to see Venice Beach as well, allow at least an additional 3 hours. Don't forget to allow an additional hour to get through security and walk through the terminal at LAX.